« Make Your Own Vegan Mayo! 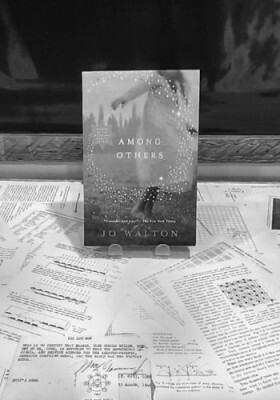 Last week, the General Science Fiction book club met to discuss Among Others by Jo Walton. Among Others won both the Nebula Award in 2011 and the Hugo Award in 2012. Walton says of Among Others: “(The way) I like to describe it is that it’s about a science fiction reader who has fantasy problems… It’s semi-autobiographical. It was odd to write for that reason, and also publishing it was odd.” Our group identified strongly with then main character, Mor, perhaps because she is an avid reader, and our group is, of course, interested in reading. But there was more to it. The day-to-day life of Mor is compelling and honest. We appreciated that. Perhaps our bookstore manager, John, said it best: “This is the best book about dealing with loss and death that I’ve ever read.” Truly one of our favorites this year. We’d love for you to join us next month! We’ll be reading “The Long Tomorrow” by Leigh Brackett and we’ll meet to discuss on August 25th at 7pm. This entry was posted on Tuesday, August 4th, 2015 at 9:00 am and is filed under Ada's Events, Book Clubs, Reviews. You can follow any responses to this entry through the RSS 2.0 feed. Both comments and pings are currently closed.